The issue of e-commerce was introduced in the WTO discussions by the United States in 1998. The proposal was that since “no Member of the WTO considers electronic transmissions as importations for customs duties purposes and, thus, not one imposes customs duties on them … WTO Members should agree to continue this current practice so that the absence of customs duties on electronic transmissions would remain” (WTO 1998a: 1).1 This proposal triggered response from a number of WTO members, which brought the issue onto the centre-stage of the work programme of the organization. In the Second Ministerial Conference in 1998, WTO members adopted the Ministerial Declaration on Global Electronic Commerce (WTO 1998b: 1), which had two operative parts. First, a comprehensive work programme was established to “examine all trade-related issues relating to global electronic commerce, including those issues identified by Members”. The work programme was to involve the relevant WTO bodies, “take into account the economic, financial, and development needs of developing countries, and recognize that work is also being undertaken in other international fora”. The second operative part of the Declaration was the endorsement by the WTO members the view of the United States regarding non-imposition of customs duties on electronic transmissions. The Declaration said that WTO members “will continue their current practice of not imposing customs duties on electronic transmissions”. This was the beginning of the process of “moratorium” on the imposing of customs duties on e-commerce, a commitment that has been renewed in every Ministerial Conference held since. In the on-going deliberations, there are demands for making the moratorium permanent (WTO 2017d: paragraph 7.17 and WTO 2017e: paragraph 1.10, and paragraph 1.22), which effectively means that henceforth no customs duties can be applied on “electronic transmissions”. Following the 1998 Ministerial Conference, a comprehensive work programme was adopted “to examine all trade-related issues relating to global electronic commerce”. The work programme defined electronic commerce “to mean the production, distribution, marketing, sale or delivery of goods and services by electronic means”. It was specified that the work programme would also “include consideration of issues relating to the development of the infrastructure for electronic commerce” (WTO 1998c: paragraph 1.3). The work programme proposed that the Councils of the WTO responsible for its three major areas, namely, goods, services and intellectual property, would consider the relevant issues, including market access issues in goods and services and the protection and enforcement of copyrights and trademarks in case of intellectual property. Besides, the Committee on Trade and Development was mandated to “examine and report on the development implications of electronic commerce, taking into account the economic, financial and development needs of developing countries” (WTO 1998c: 1-3). Although the broad contours of the work programme were laid out, in subsequent years, several WTO members argued that in keeping with the progress of technology, there was a case for a wider coverage of e-commerce. For instance, some members pointed to the “benefits and opportunities that E-Commerce could provide to developing countries, least developed countries (LDCs), and small and medium sized enterprises”. These members also “referred to the fact that the digital economy had developed significantly over several decades although only limited progress had been achieved at the WTO itself” (WTO 2017c: 1). There have been also been suggestions for a new work programme to develop a negotiating mandate to deal with all these issues. This paper explores the various facets of e-commerce and their possible implications on the dynamics of the WTO. The discussion would focus on some of the critical aspects of changes in e-commerce as it has evolved since it was included in the WTO work programme in 1998. The first is that the definition of e-commerce has changed with the progress of technology and the models of doing business of the various players, including business, individuals/consumers, governments, and other private organizations. Consequently, the nature of transactions using this platform has also undergone a metamorphosis; the once focused digital products have now been joined by more conventional goods and services. And, last but not the least, the economic interests of at least some of the members of the WTO have also changed in keeping with the above-mentioned developments, which has changed the contours of the debate within the organization. At the outset, the paper would consider the evolution of the idea of e-commerce and its possible manifestations in the realm of trade. The second section will discuss the likely impact of e-commerce on WTO rules. The third section would analyse some of the recent proposals on e-commerce, with a view to understand the trajectory of shifts in the WTO disciplines that could happen. The fourth section examines some of the indicators on the digital infrastructure to understand the relative capacities, especially of the demandeurs of e-commerce, to benefit from e-commerce. Evolution of e-commerce cannot be understood without first understanding the coverage of this platform. In this section, we will make an attempt to clarify the definitional issues concerning e-commerce. We will begin by providing the perspective of the WTO and would follow it up with that of the OECD. In the later part of this discussion, we will allude to some conceptual problems in the literature of e-commerce. We have mentioned earlier that the WTO took cognisance of e-commerce through the Ministerial Declaration in 1998. Importantly, the Declaration gave no definition of e-commerce; work programme gave the responsibility to the WTO Members to identify the issues. The definition was provided in the Work Programme on Electronic Commerce that was adopted following the Ministerial Declaration (WTO 1998c: 1). The term “electronic commerce” was defined as the “production, distribution, marketing, sale or delivery of goods and services by electronic means”. It was clarified that the work programme would also consider issues relating to the development of the infrastructure for electronic commerce. In subsequent discussions, several members dwelled on the need to provide a detailed definition of e-commerce. One member suggested that four categories of transactions could fall under a working definition of e-commerce (WTO 1999b: 3). These were: (i) electronically conducted transactions combined with physical delivery of goods; (ii) trade in goods related to electronic commerce (e.g. computers); (iii) sale of carrier media such as CD’s or tapes, which contain digitalized information (e.g., software or music); content of the carrier media; and (iv) digitalized information transmitted by electronic means, i.e. electronic transmissions. This definition was the first instance of the broadening of the definition of e-commerce beyond “electronically transmitted” goods and services. Although the 1998 definition remains as the “official” definition of e-commerce in the WTO2, the organization’s recent conceptualisation of the e-commerce seems at considerable variance with the 1998 definition. In 2013, the WTO Secretariat provided a definition of e-commerce: “… e-commerce is the sale or purchase of goods or services, conducted over computer networks by methods specifically designed for the purpose of receiving or placing of orders. Even though goods or services are ordered electronically, the payment and the ultimate delivery of the goods or services do not have to be conducted online” (WTO 2013: 6). In the run-up to the Tenth WTO Ministerial Conference held in Nairobi in 2015, the Secretariat produced a “Briefing Note”, which provided another definition: “Electronic commerce, commonly known as e-commerce, involves the digital transfer of goods and services across borders. Broadly speaking, e-commerce is the sale or purchase of goods or services conducted over the internet or other computer networks. An e-commerce transaction can be between enterprises, households, individuals, governments and other public or private organizations” (WTO 2015: 1). There is clear divergence of the Secretariat position on e-commerce as compared to the long maintained “official” definition adopted in 1998. The Secretariat’s definition of e-commerce, namely, “sale or purchase of goods or services conducted over the internet or other computer networks”, adds a new dimension to the platform, especially in terms of the WTO disciplines on market access in goods and services. This issue will be dealt with in a later section. The OECD provides an interesting perspective as to how the term e-commerce has evolved over time through the definitions on the mode of transaction that the organization had adopted. In 2001, the organization endorsed two definitions of electronic transactions which were “based on narrower and broader definitions of the communications infrastructure”. The broad definition of e-commerce read as follows: “An electronic transaction is the sale or purchase of goods or services, whether between businesses, households, individuals, governments, and other public or private organisations, conducted over computer-mediated networks. The goods and services are ordered over those networks, but the payment and the ultimate delivery of the good or service may be conducted on or off-line”. This definition included orders received or placed on any online application and used in automated transactions such as Internet applications, electronic data interchange (EDI), Minitel or interactive telephone systems (OECD 2011: 71-72). The narrow definition read as follows: “An Internet transaction is the sale or purchase of goods or services, whether between businesses, households, individuals, governments, and other public or private organisations, conducted over the Internet. The goods and services are ordered over the Internet, but the payment and the ultimate delivery of the good or service may be conducted on or off-line”. This definition includes transactions taking place on any Internet application used in automated transactions such as web pages, Extranets and other applications that run over the Internet, such as EDI over the Internet, Minitel over the Internet, or over any other web enabled application irrespective of the instrument through which the web is accessed, namely through a mobile phone instrument or a television set. This definition excludes orders received or placed by telephone, facsimile, or conventional e-mail. In 2009, the OECD produced a single definition of e-commerce, combining the broad and narrow definitions of 2001: “An e-commerce transaction is the sale or purchase of goods or services, conducted over computer networks by methods specifically designed for the purpose of receiving or placing of orders. The goods or services are ordered by those methods, but the payment and the ultimate delivery of the goods or services do not have to be conducted online. An e-commerce transaction can be between enterprises, households, individuals, governments, and other public or private organisations”. Using this definition, any orders made via web pages, extranet or EDI are admissible as e-commerce. Orders placed via telephone calls, facsimile, or manually typed e-mail were all excluded. The 2009 definition was based on a few basic principles. (i) It was meant to be coherent, simple and pragmatic. (ii) It did not attempt to cover all modes of electronic transactions, but focused only on those that were known and were definable, besides being the most important. (iii) It recognised that as technologies and policies evolved, new forms of e-commerce that were not defined or included might become of interest and would have to be considered in the future. (ii) The term “computer-mediated networks” was replaced by “computer networks”, which avoided the ambiguities about the technologies used in e-commerce transactions. (iii) The new definition includes the statement “by methods specifically designed for the purpose of receiving or placing orders”. This was done for making it clear that e-commerce does not target all activities over networks, but only those that are specifically intended for selling. This also implies the presence of an e-sales system. Orders placed through manually typed e-mails, telephone calls or facsimile are now excluded. The OECD definition of e-commerce brings the conceptual understanding of the platform significantly closer to the real world, wherein conduct of trade in goods and services by consumers, businesses and other entities, over the internet is generally understood as e-commerce. Included in this definition are digital products, which are clearly distinguished by OECD, namely the sale or purchase of goods or services, conducted over computer networks by methods specifically designed for the purpose of receiving or placing of orders. There is considerable ambiguity regarding the definition of “digital products”. This ambiguity becomes particularly significant in the context of trade in digital products and the applicability of the WTO rules, especially those related to market access, for conducting such trade. In light of the above, two relevant issues arise: (i) how well do the existing WTO rules cover the digital products as defined by the OECD; and (ii) how would be the likely implications the proposals on e-commerce that are being made in the run-up to the Buenos Aires Ministerial. In the following sections, we will discuss these two issues in some detail. Trade in digital products can be divided into four categories: (i) cross-border transactions that are digitally ordered, or international trade in goods and services taking place through e-commerce; (ii) use of intermediary platforms such as Amazon, Uber or Alibaba; (iii) those that are digitally delivered like software and e-books; and (iv) 3-D printing, or additive manufacturing (OECD 2016; OECD 2017: 6-7)3. The first two categories of digital products have considerable similarity, in that the digitally delivered goods and services are increasingly using the platforms mentioned above. The third category has an obvious connect with the physical products, on the one hand, and delivery of services, on the other. This category includes a number of products which were traditionally delivered as goods, but technology now allows them to be sent in digital form. They include software and media products, and includes film, various types of printed material, video games and various recorded information on carrier media such as tapes, CDs, CD-ROMs and diskettes. In case of the fourth category, namely additive manufacturing, it is still less clear as to how the delivery takes place, i.e. digitally or physically (OECD 2016: 4). It is fairly obvious from the aforementioned that understanding of what is being traded, applicability of WTO rules can be attempted. Digitally ordered cross-border transactions involving goods and services fits into OECD’s 2009 definition of e-commerce mentioned above. How do the WTO disciplines apply to this form of trade? Existing set of WTO rules for trade in goods, including all the border measures like tariffs and other non-tariff measures were developed since the establishment of General Agreement on Tariffs and Trade (GATT) in 1948, and can be applied in this form of e-commerce and there is no apparent conflict with these rules. However, these rules can face an uncertain future for the following reason: in the on-going discussion on e-commerce a number of countries have made a strong pitch to create an enabling environment for the growth of e-commerce, which includes “open markets” (WTO 2017a: 3). In other words, e-commerce is being used to further the trade liberalisation agenda and by giving a short-shrift to the on-going discussions on market access in both agriculture and non-agricultural products. As regards trade in services involving e-commerce, WTO rules on electronically delivered services are not clearly defined in the General Agreement on Trade in Services (GATS). However, this issue has been addressed in the dispute between the Antigua and Barbuda and the United States (WTO 2004). Antigua and Barbuda had complained that the United States had taken “Measures Affecting the Cross-Border Supply of Gambling and Betting Services” that its Internet-based, “remote-access” gaming industry was providing. In this dispute, one of the main issues before the WTO’s Dispute Settlement Mechanism was whether the services provided by Antigua’s internet gaming industry constituted a service under the GATS. The Panel noted that the definition of “gambling and betting services” for the purposes of this dispute includes, at a minimum, the services that Antigua seeks to supply cross-border to the United States as well as the other services the supply of which the United States allows cross-border. The decision of the Panel was subsequently endorsed by the Appellate Body, constituted to hear the appeals against the ruling of the Panel by the United States (WTO 2005). Interestingly, views similar to that of the Panel had earlier found a mention in a submission made by the United States in 1999, in which the following position was taken: “there should be no question that where market access and national treatment commitments exist, they encompass the delivery of the service through electronic means, in keeping with the principle of technological neutrality” (WTO 1999a; 3). Although the Panel and the Appellate Body in the aforementioned dispute had established that electronically delivered services were covered by the GATS, this was enabled by the fact that at the end of the Uruguay Round, the United States had taken specific commitments on gambling and betting services. This fact was confirmed by the Panel in its findings (WTO 2004; 272). Thus, liberalisation of electronically delivered services, even if it happens under the push from e-commerce would only affect countries in the sectors which they had included in their schedule of commitments at the end of the Uruguay Round. The “positive list approach” guiding liberalisation of services in the WTO means that unless members agree to open up the service sectors, they do not have to weigh the implications of promoting electronically delivered services. The progress of “additive manufacturing” better known as “3D printing” has added a new dimension to dealing with digital trade. In the current decade, this branch of manufacturing has been expanding at a rapid rate. Between 2012 and 2014, the additive manufacturing industry grew at a compound rate of nearly 34% (McCue 2016), and although in the two following years, the growth rates have declined to 25.9% and 17.4% respectively (Wohler Associates 2017), respectively, the flexibility of this production system to produce almost everything, coupled with its growing popularity among major companies, are seen as indicators of its potential. Additive manufacturing has the potential to create everything “from a lithium-ion micro-battery to a human kidney, and can print in materials like plastic, metal, ceramic, cement, wood, food, and human cells” (Tan 2016: 508). A number of major companies have been using additive manufacturing for the past several years. Boeing uses 3D printers to make about 200 parts for ten different types of aircraft; medical-products companies are using the technology to create hip replacements, (Cohen, Sargeant and Somers 2014); General Electric uses additive manufacturing for jet engines and medical devices and Lockheed Martin and Boeing for aerospace equipment (Fleuter 2017). Thus, despite the miniscule presence of this disruptive manufacturing technology (one survey informs that in 2016, additive manufacturing was a $ 6 billion industry), the rapid growth that is expected in the years ahead justifies the need to understand the applicability of WTO rules to this segment of digital products. Trade in 3D printed products is similar to digitally delivered transactions, for it involves the business of producing a computer aided design (CAD) and printing the file containing the design in another country. The cross-border transaction involves “digitally delivered design service rendered into a product in the country of delivery” (OECD 2016: 6). How should the WTO rules treat trade in digital products, in particular trade in products of additive manufacturing? According to the OECD, there is a lack of clarity over the trade rules that apply to this product. Since 3D printing could involve a transaction that is delivered directly to the consumer, it is a design service which crosses the border, implying thereby that GATS rules should apply. But then, this service ultimately produces a product and so the transaction could also be considered a digitally delivered product, which is therefore subject to WTO rules (OECD 2016: 6). Additive manufacturing is pushing the boundaries of the WTO disciplines, especially those on market access, to the very limit. This form of manufacturing is designed to take the task of manufacturing closer to the consumer. When manufacturing of products moves to the same country where the products are consumed, the key disciplines of the WTO applied at the border, including those on market access and trade defense measures, among others, may be passé. WTO rules cannot also be applied on part of the productive chain in case of additive manufacturing, since intermediate goods are removed from the production process and are replaced by a number of services-related activities, which is the main change that takes place when additive manufacturing is used. The services activities that are thus introduced, include, (i) designing and engineering computer-aided design (CAD); (ii) transferring this in the form of digital information; (iii) establishing online market-places where CAD-files can be traded; and (iv) establishing and running contract manufacturing facilities, including retail oriented print shops (National Board of Trade. 2016: 24). Given its nature of transactions, additive manufacturing can only be governed by GATS rules. The foregoing discussion makes it clear that transactions involving e-commerce would be covered by the GATS disciplines. This fact, coupled with the seeming irrelevance of the rules governing trade in goods, could lead to de facto “open markets” in the goods sector. In terms of the rules framework, this situation can best be described as “Servicification” of trade rules. Several WTO members have contributed to the idea of “Servicification” trade rules, as we shall discuss below. We would argue that “Servicification” could have a major impact on the multilateral trading system for it could adversely affect the existing uneasy balance in the WTO rules. Global community’s endeavour to develop rules for cross-border transactions in goods that began with the adoption of the General Agreement on Tariffs and Trade (GATT) in 1947, has come a full circle with e-commerce coming on to the centre-stage over the past few years. This has been the result of an engaging discussion involving a sizeable number of countries across the development spectrum, which we shall elaborate in the following section. Here we will dwell on a systemic issue, namely, the possible changes on multilateral trade rules that can be caused by this mode of cross-border trade. Two processes have simultaneously lent their weight to this possibility. The first is a two-decade old agreement among the WTO members not to impose tariffs on electronic transmissions, which has now taken the form of the proposal for permanent moratorium, which we had alluded to at the outset. And, the second was the growing recognition among a sizeable number of members that e-commerce should be governed by the GATS4 (and also the regime of intellectual property rights). In the context of e-commerce, WTO members have been emphasising the importance of the GATS rules immediately after the Work Programme on E-Commerce was adopted in 1998. One of the early proposals to direct the course of the discussions in e-commerce came from Canada, which argued “that the electronic delivery of services falls within the scope of the GATS, since the Agreement applies to all services regardless of the means by which they are delivered. Measures affecting services supplied by electronic means are measures affecting trade in services and would therefore be covered by GATS obligations” (WTO 1999d: 1). In this regard, the European Commission gave a plain interpretation of the WTO disciplines: “electronic deliveries, which consist of services and therefore fall within the scope of the GATS” (WTO 1999c: 2). The critical question that was addressed related to whether importation takes place when data are transmitted electronically. One member observed that customs duties were applied to goods by a country only when there was a cross-border trade transaction. With electronic commerce, especially with the mediation of the internet, it is unclear whether a cross-border transaction is involved, or whether “importation” in the sense of Article II of the GATT takes place. Article II of the GATT allows WTO members to apply customs duties upon importation of a product. If no importation is involved, electronic transmissions can be taken out of the coverage of customs duties; importantly, this is what the Ministerial Decisions on e-commerce have facilitated since 1998. For realising the aforementioned objectives, WTO members agreed to enter into “reciprocal and mutually advantageous arrangements directed to the substantial reduction of tariffs and other barriers to trade and to the elimination of discriminatory treatment in international trade relations”. “Taken together, the relevant aspects of the WTO Agreement and the GATT 1994 indicate that concessions made by WTO Members should be interpreted so as to further the general objective of the expansion of trade in goods and the substantial reduction of tariffs. It is also clear that such an interpretation is limited by the condition that arrangements entered into by Members be reciprocal and mutually advantageous. In other words, the terms of a concession should not be interpreted in such a way that would disrupt the balance of concessions negotiated by the parties” (emphasis added) (WTO 2005: 102). The second point is that most developing countries continue to use conventional trade policy instruments, like tariffs to pursue their development objectives.8 The Doha Round negotiations have shown that a large number of these countries were seeking to recalibrate their tariff protection on sensitive products, which included their demand to provide additional dose of protection on agricultural products (Dhar and Das 2015). Therefore, eliminating the tariffs on goods for promoting e-commerce would tantamount to, in the words of the Panel in the EC-Chicken Cuts, disrupting the “balance of concessions” negotiated by the WTO members, which would worsen the already widening development gaps between WTO Members since a large number of members, especially the developing and the least developed countries, which have not explicitly spoken of benefits from trade liberalisation through e-commerce9, would not get any reciprocal benefits. In the following section, we would present the recent discussions on e-commerce, highlighting the key elements in the positions taken by the participating countries. As mentioned earlier, the debate on e-commerce in the WTO has cut across development lines, with several developing countries speaking in favour of e-commerce, especially from the point of view of their micro, small and medium enterprises (MSMEs). A key feature of the discussion on e-commerce is the active participation by a 12-member group of developing countries, the Friends of E-Commerce for Development (FED)11. The group’s view is that e-commerce is a tool that “brings together the digital, social and development agendas and as an enabler of sustainable and inclusive growth for MSMEs, especially those from developing and least developed countries” (WTO 2017d: 117). The presence of the FEDs is significant for two reasons: one, it is the first non-negotiating group of countries, and that too from the developing world, to have put its imprint on an issue that would expand the coverage of the WTO, and two, the group has forged coalitions with a number of developed countries, which is somewhat unusual for developing countries dealing with a new issue in the WTO. A submission backed by several FEDs members, alludes to the ways in which e-commerce can be and has been leveraged to support development, which includes opening up of new opportunities for businesses in developing countries (WTO 2017b). The major beneficiaries, according to this proposal, would be the MSMEs, who would gain from e-commerce through the reduction of the cost of doing business, and access to a wider market for the enterprises. Non-traditional players, such as home-makers and small handicraft suppliers, can enter the market and offer their products on the global marketplace. Digital platforms can help improve efficiencies, not only of individual enterprises also of the entire supply chains. This is an untapped potential that could provide a boost to economic growth and development in developing countries. These countries proposed that the discussions could identify the e-commerce issues of interest and relevance to developing countries, including trade facilitation and e-commerce, infrastructure gaps to enable e-commerce, access to payment solutions and online security. A 13-member group12, including the European Union and developing countries like Côte d’Ivoire, Paraguay and Singapore, proposed amending the WTO rules and the overall structure of trade policies for making them more suited to the functioning of the digital economy (WTO 2017a: 1). These countries argued that that digital technology is transforming the global economy and that this transformation promises several development friendly outcomes, including “new opportunities to promote inclusive economic growth, including by connecting rural to urban economies; opening new channels of trade for landlocked countries; facilitating the participation of women and micro enterprises in the formal economy; providing micro, small and medium-sized enterprises (MSMEs) access to a global consumer base; and facilitating cross-border trade in services previously considered not technically feasible”. The proposal offered a tentative list of all trade-related elements relevant for e-commerce that needed to be discussed, which were in four clusters, namely, (a) regulatory frameworks; (b) open markets; (c) initiatives facilitating the development of e-commerce; and (d) transparency of the multilateral trading system. Elements of the regulatory frameworks were included in three groups: (i) enhanced transparency; (ii) consumer confidence enhancing measures; and (iii) trade facilitating measures. The last of these groups included some critical elements, which were, among others, (i) open networks / access to and use of the internet; (ii) electronic payments; (iii) access to and use of communications networks; (iv) intellectual property rights; (v) recognition of e-signatures / authentication; and (vi) technical standards. These elements were part of the WTO discipline, and although the proposal was silent as to whether the proponents wanted to initiate discussions on amending them. The second cluster, the heart of the proposal in terms of its concreteness, spoke of the liberalisation commitments that must be promoted to facilitate digital trade and the adoption of measures to ensure openness. In the services sector, trade must be opened up in all e-commerce-relevant sectors, e.g. (telecom; computer; mode 1 delivery; business services; professional services), while in the goods sector, the proposal was in favour of freeing of trade as was done in the Information Technology Agreement (ITA)13. Measures to ensure openness included in the proposal were (i) disciplines ensuring cross-border data flows; (ii) disciplines with respect to localisation (local presence – including of computer servers, local content); and (iii) addressing the transfer of and/or access to source code. This proposal was therefore aimed at initiating a process of re-visiting some of the core agreements of the WTO, and for introducing a barrier-free world in goods and services. Four recent submissions, three of which are multi-country submissions, provide important directions to the on-going debate14. We will briefly provide the key points made in these submissions. 19 members, including three FED protagonists, have focused on the process-related issues. These countries have expressed their view that given the increasing importance of e-commerce as an important driver of inclusive economic development, more clarity is needed on “how the current process can be improved, what issues to focus on, and how to facilitate Members arriving on concrete recommendations on the way forward” (WTO 2017f: paragraph 1.6). These countries have suggested that discussions on these issues “should be captured in the MC11 Ministerial Decision on E-commerce” and that “Ministers … should give clear direction for future work in e-commerce, with development at the core, and set out a clear, updated framework/process through which future work could be undertaken” (WTO 2017f: paragraph 1.8). Seven countries, including the European Union, Republic of Korea and Australia, have tabled a Draft Ministerial Decision on Electronic Commerce, which seeks to “establish a Working Party on Electronic Commerce” to “conduct preparations for and carry out negotiations on trade-related aspects of electronic commerce on the basis of proposals by Members”. These countries emphasised that WTO members should maintain the “current practice of not imposing customs duties on electronic transmissions” until the next Ministerial Conference in 2019 (WTO 2017h). China’s approach to getting e-commerce included as a part of the WTO work programme was to identify the elements acceptable to Members that may be reflected in the MC11 Work Programme on Electronic Commerce. This can then be the “key building blocks … for a high-priority discussion in the Dedicated Session of the General Council or a body to be agreed upon by all Members” (WTO 2017h: 1). The elements identified by China are: (i) moratorium of customs duties on electronic transmissions; (ii) facilitating cross-border e-commerce; (iii) promoting paperless trading; (iv) transparency; and (v) development and co-operation (WTO 2017i). China’s substantive point in its proposal was that “free zones and customs warehouses and other good practices facilitating cross-border e-commerce have played a key role in promoting the development of industries”. The suggestion was that “Members’ successful experiences … may be summarized at MC11 for reference by other Members to promote the latter’s development of e-commerce and better achieve the goals of inclusive growth in accordance with their individual circumstances” (WTO 2017i: paragraph 2.1). China’s proposal was that WTO Members may: (i) share the status of relevant domestic legislations or offer summary-type introductive materials, the content of which may include but not be limited to the definition and categories, establishment and closure, administration and regulation of free zones and customs warehouses, and authorized operations as well as the period of storage therein; (ii) discuss the capacity building of developing Members in the context of policies of free zones and customs warehouses as well as their relationship with the development of e-commerce, (iii) request the WTO Secretariat to assist in understanding and drawing upon the relevant work of the World Customs Organization (WCO), and build a cooperative relationship with it if necessary; and (iv) explore more concrete issues relating to the facilitation of e-commerce based on the Kyoto Convention of the WCO on simplification of customs procedures as they apply to free zones and customs warehouses given their own experiences with one, so as to better serve the objective of promoting inclusive trade and development through e-commerce (WTO 2017i: 2). China’s proposal was also important from its perspective on development and cooperation. The proposal was an excellent example of how in the WTO, development dimension has been reduced to a formulation that is not intended to have any operational significance. This is evident from China’s proposal which states: “e-commerce work at the WTO should take into full account the actual situation of Members at different stages of development, in particular the specific demands of developing and least developed Members, strive to solve the problems of development to their general concern, and enhance the ability of developing Members to benefit from e-commerce, and take the principle of special and differential treatment as an integral part”. China expects that the e-commerce work in the WTO should take fully into account the “actual situation of Members at different stages of development, in particular the specific demands of developing and least developed Members”. This is an interesting formulation given that the current discussion on e-commerce has not taken into account the needs of the developing countries, especially their preparedness to take advantage of the e-commerce platform. In this context, it should be pointed out that the engagement of WTO members on e-commerce is diametrically opposite to that seen in case of the Trade Facilitation Agreement. While in the case of the latter, the developing country members were actively engaged in securing an assurance that their development needs would be taken into consideration, including their financial needs to implement the TFA, in case of e-commerce, the FED and other developing countries like China, had begun their engagement in the discussions on the subject assuming that developing countries were already prepared to take advantage of the platform, which could then benefit their MSMEs.15 Such a position implies that the developing countries do not need any special and differential treatment because e-commerce is inherently development friendly. The past arguments on the development implications of trade liberalisation also became immediately irrelevant since market-opening via e-commerce was projected as a major benefit for the developing countries. Interestingly, several of these counter points to e-commerce and the development implications of the platform were cogently put by the African Group. The group questioned the views that e-commerce can help develop the MSMEs and eliminate “the supply-side constraints, lack of technology and lack of finance, and the SPS (Sanitary and Phytosanitary Standards) and TBT (Technical Barriers to Trade) constraints that many MSMEs face” (WTO 2017j: paragraph 3.3). MSMEs, in view of the African Group, would be least likely to “effectively compete with multinational corporations, who have become global digital leaders, and have decimated smaller companies and who have benefitted from digital industrial policies such as subsidies, R&D subsidies, development of, and access to, and ownership of technologies, economies of scale, government-sponsored infrastructure, tax benefits …” (WTO 2017j: paragraph 3.3). In terms of the way forward, the African Group made two observations. The first is that the e-commerce work programme “has not been adequately tested to warrant a change in its structure”. A large number of submissions have been tabled in the relevant bodies, but there “is a general reluctance by proponents to discuss their submissions in any meaningful way both horizontally, and in the relevant [WTO] bodies, possibly in the hope that they would seek to create a separate forum for their agenda …” Secondly on the question of moratorium, the African Group brought up the “revenue implications of the current moratorium on customs duties, particularly in the context of increasing digitization of goods and services”. Therefore, their view was that “the renewal of the moratorium should not be seen as automatic” (WTO 2017j: 5). The African Group has indeed raised some pertinent questions regarding the professed development dimensions of e-commerce and the projected gains for the MSMEs in developing countries. This aspect of e-commerce needs to be critically analysed in a detailed manner. While this exercise will not be attempted in the present paper, we would provide a few indicators of developing countries’ access to the digital infrastructure, which will be used to make a broad assessment of the arguments about likely benefits for the developing countries and their MSMEs arising from e-commerce, which have been advanced in the submissions we had discussed above. (V) Are There Prospects of Gains for Developing Countries from E-Commerce? In answering this question, we would limit ourselves to looking at some of the key parameters of digital infrastructure across countries, comparable data for which were obtained from the World Development Indicators (WDI). Alongside, we would refer to data and information provided by The Global Information Technology Report, the annual survey conducted by the World Economic Forum. The WDI provides three parameters for assessing the digital infrastructure across countries. These are percentage of a country’s population using the internet and fixed broadband, and secure internet servers available to the population. In our view, these indicators can be used to understand the situation prevailing in different countries regarding the relative access of their populations to the infrastructure that is vitally necessary for conducting business using the digital platform. 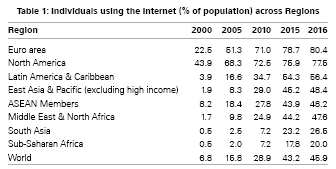 Table 1 provides the data on access to internet to the populations of countries across regional groupings. Access to the internet is very unevenly distributed across the regions. While for most developing country regions, the figures are close to the global average, for South Asia and Sub-Saharan Africa they are considerably lower, almost 3-4 times lower than that in the Euro Area, the region with the highest share. The disparities in internet use in countries at different levels of incomes shown in Table 2 are quite stark. The Table shows that in 2016, even the middle income countries’ access to internet is almost one-half of that in the OECD member countries. 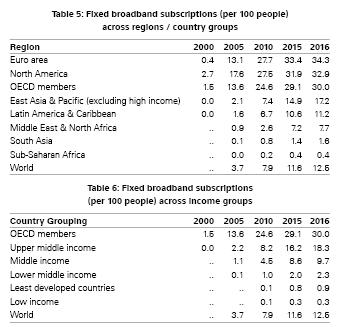 Internet access in both low income and the least developed countries has improved, but in terms of the percentages shares, their gaps with the OECD countries have widened. Table 3 shows the wide variation of internet use across the demandeurs for the inclusion of e-commerce in the WTO, from amongst the developing countries. In countries like Pakistan, Nigeria, Kenya and Cote D’Ivoire, access to internet is between 2-3 times lower than the world average. Another important fact is the wide variation in internet access within the group of demandeurs. While access to internet in Pakistan is almost five times lower than that of Moldova in the group of Friends for E-Commerce for Development (FED), in the group of other demandeurs, Cote d’Ivoire’s figure is nearly 2.5 times lower than that of Qatar. The ASEAN countries have been among those supporting development of WTO rules for e-commerce, but the figures for internet access across the membership of the bloc is remarkably divergent. In 2016, figures of internet access of 6 of the 10 ASEAN members were lower than the average for the region as a whole, implying thereby that the lagging countries, especially the least developed members, Cambodia, Lao and Myanmar, have to do considerable catching-up. In order to make e-commerce work effectively and efficiently, business must have access to fixed broadband subscriptions. Table 5 shows the access to fixed band internet subscriptions across regions / country groups. The global average is only 12.5%, which assumes that every person has only one connection. This is an unrealistic assumption since those with higher income incomes, including the corporate sector, usually have multiple subscriptions. Sub-Saharan Africa and South Asia show yet again that their infrastructure is extremely inadequate for large scale expansion of e-commerce. Table 6 shows that low income and the least developed countries have grossly inadequate infrastructure to be able to use e-commerce as an effective platform for doing business. Importantly, the table shows that the middle income countries too are constrained. Table 6 can be thus used to argue that e-commerce faces a binding constraint in most of the developing countries. Table 7 shows that in three members of the FED, namely, Pakistan, Kenya and Nigeria, a negligible share of their populations has access to fixed broad band subscriptions. Six of the 12 FED members have fixed broadband subscriptions that are lower than the world average. In the list of other demandeurs, China and Russian Federation are the only two major WTO members whose fixed broadband subscriptions are higher than the global average. The ASEAN members have been one of the demandeurs for inclusion of e-commerce. But, as Table 8 shows, all countries of the region, except Singapore, have fixed broadband subscriptions lower than the global average. Consequently, the average for the region is also well below the global average. Three members of the grouping, Myanmar, Lao PDR and Cambodia have negligible shares. The ASEAN, therefore, show very little preparedness to take advantage of the e-commerce platform, thus contradicting their optimism regarding the benefits flowing from the inclusion of e-commerce in the WTO. Access to secure internet servers is most critical for assuring the businesses and their customers of a safe and secure ecosystem to do business. Table 9 shows that as in all the indicators discussed above, South Asia and Sub-Saharan Africa have very few secure internet servers as compared to the other regions. With such numbers, the two regions can have very limited presence in digital trade. The noticeable feature of the data presented in the above table is that all developing country regions are well short in terms of providing secure servers. The relatively advanced ASEAN region is also inadequately prepared in terms of secured servers. Data on countries at different levels of income (Table 10) shows that the lower income and the least developed countries, and to an extent the low middle income countries, do not have the necessary infrastructure to provide adequate security to businesses to participate in digital trade in a significant manner. As compared to the OECD countries, the developing country capacities to provide secure servers seem miniscule. 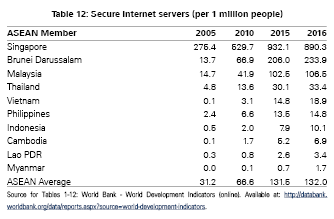 Table 11 provides a view of the situation in the developing country demandeurs as regards secure servers. Except Hong Kong, Russian Federation, Qatar, and a few countries in the Latin American region, all other countries have major limitations in this area. China, world’s largest retail e-commerce market, showed surprising lack of the secure servers, which only exacerbates the concerns regarding data security in the country. But this situation could rapidly change for three reasons: one, China’s Cyber-security Law has come into effect in 2017, which, among other things, focuses on “security of critical information infrastructure” (KPMG 2017: 11) ; two, a draft law on e-commerce is being prepared that addresses the needs of digital trade (Draft e-commerce 2017); and three, the recent decision of the State Council to promote “internet plus advanced manufacturing”, which will involve the construction and the upgrading of internet infrastructure in industrial enterprises so as to enable greater interconnectivity within enterprises (Wei 2017). As mentioned earlier, the ASEAN region as a whole shows relative weakness on this score. Data for individual members provided in Table 12, shows that with the exception of three countries, Singapore, Malaysia and Brunei, all other ASEAN members are not sufficiently prepared to pick-up the challenges of digital trade. The final set of numbers that we will use for commenting on the state of preparedness of the developing countries demanding introduction of e-commerce in the WTO are from ‘The Global Information Technology Report’, the annual publication of the World Economic Forum. The Report presents the results of the ‘Networked Readiness Index’ for 139 countries, ranking the countries in terms of their readiness. Table 13 shows the ranks of the select set of countries for the two most recent years. The Networked Readiness Index (NRI) is a composite indicator made up of four main categories (sub-indexes), 10 subcategories (pillars), and 53 individual indicators distributed across the different pillars. Based on this framework, the network readiness of the developing countries, which we had selected for our earlier discussion, is shown in Table 14. The table 14 shows an interesting trend: the smaller countries seem more ready to face the challenges of the networked economy than the larger countries. 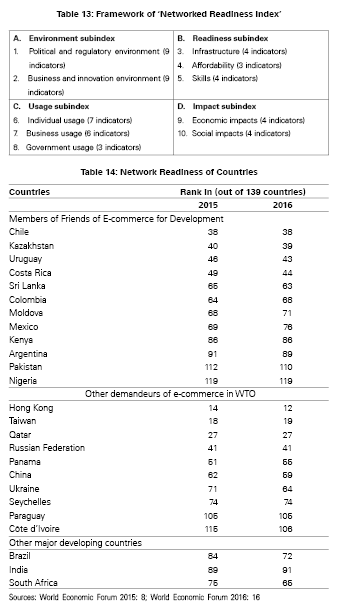 From among the ‘Friends of E-Commerce for Development’, Pakistan and Nigeria were well down the list of countries that were adequately “network ready”. The relatively advanced developing countries like Mexico and Argentina were also not doing too well. The low levels of network readiness showed by the larger countries put into serious doubt their ability to participate in digital trade in a meaningful manner. There is only one conclusion that can be made from the above exercise. Developing countries, especially the low income and least developed countries face serious inadequacies in their digital infrastructure, which would not allow them to effective participants in global e-commerce. But these inadequacies and the ways to deal with them have largely remained unaddressed in the discussions on e-commerce. This is a definite pointer that the capacities of the developing countries to become meaningful players are not going to improve in the medium term. 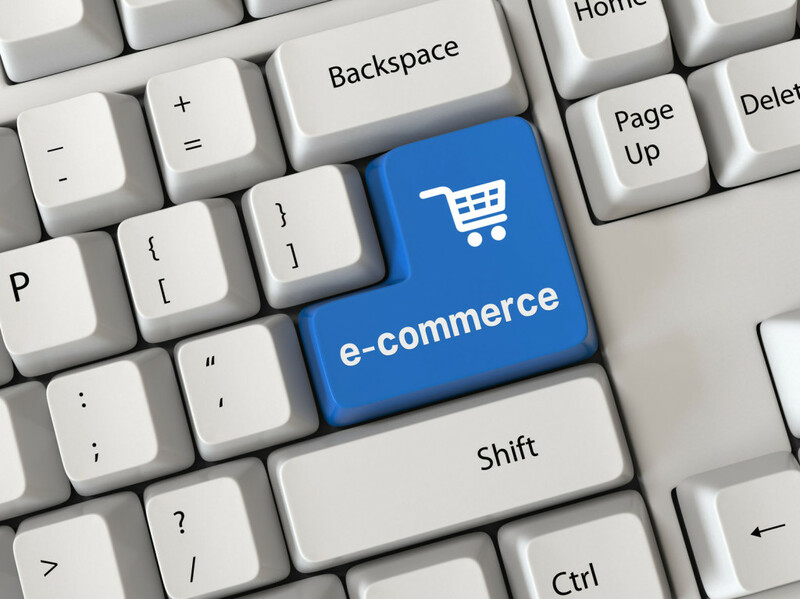 E-commerce has become one of the focus issues as the WTO members prepare for the 11th Ministerial Conference of the organisation in December 2017. This issue is not new in the WTO – in 1998, members decided to “establish a comprehensive work programme to examine all trade-related issues relating to global electronic commerce”. At the same time, the members agreed to “continue their current practice of not imposing customs duties on electronic transmissions” (WTO 1998b). The e-commerce work programme was established in the WTO just as the enormous possibilities of world of digital trade were beginning to be explored. In the initial years of their engagement on e-commerce, several members made attempts to understand the applicability of WTO rules to electronic transmissions. During most of the subsequent years, all that the members did was to ritualistically extend the moratorium on customs duties in every subsequent Ministerial Conference. In the meanwhile, however, e-commerce had started to spawn several complex business models using the growing power and presence of the internet. This happened as nations, businesses and consumers started becoming increasingly networked. E-commerce was transacting business in not only digital products but also a range of goods and services. The traditional ways of conducting business in the global markets were being seriously challenged by a small band of companies that were able to effectively harness the powers of the internet. A technological breakthrough added further sinews to e-commerce. This was the emergence of 3D printing. Using this technology, products could cross international boundaries while they were in the digital form; they came on their own with the help of a digital printer sitting next to the consumer. Importantly, the OECD was always at hand to recognise the changing nature of e-commerce and provided appropriate definitions to capture the business in all its manifestations. The applicability of the WTO rules to such forms of cross-border trade was the most challenging task. WTO members only had the moratorium on customs duties with which to deal with e-commerce. However, as we have discussed in this paper, most of the dealings under e-commerce are in one or the other form of services and should hence be dealt by the General Agreement on Trade in Services (GATS). This also means that the rules on goods encapsulated by the General Agreement on Tariffs and Trade (GATT) are becoming irrelevant. We have called this process, “Servicification” of trade rules. Serious discussions on the future of e-commerce in the WTO began after the 10th Ministerial Conference in 2015. The discussions gained momentum when a group of developing countries, namely the Friends of E-Commerce for Development” (FED) began emphasising the importance of e-commerce for their economies, especially their Micro, Small and Medium Enterprises (MSMEs). This development was unique in the two decade history of the WTO – never before had the developing countries proactively put their might behind a new issue. The discussions on e-commerce have largely centred on making the global markets open for e-commerce to take-off. With the FED and a few other developing countries lending their support from a “development perspective”, the stage seems ripe for e-commerce to lead the next round of trade liberalisation. The advanced countries that have witnessed their ambitions of pushing for trade liberalisation face serious opposition from developing country coalitions in the Doha Round, and they now see market opening on the back of e-commerce as the opportunity to realise their long awaited ambition of gaining market access. This opportunity could not have come at a better time for them. Economies of the North are beginning to stabilise, exactly a decade after the most recent economic downturn, and the additional market access they could gain, if the attempts to free the markets via e-commerce succeed, would do them no harm. Two questions arise in this context. The first, which we have mentioned only in the passing, is the impact that the e-commerce-led trade liberalisation would have on the future of the WTO. The second, and an equally pertinent question, is whether the proponents of e-commerce from the developing world have the necessary infrastructure to realise their professed gains from e-commerce. We would conclude by briefly looking at these two dimensions. We had mentioned in an earlier discussion that the push for comprehensively opening the markets for goods and a simultaneous move towards “Servicification” of trade disciplines can have far reaching implications on the outcomes of multilateral trade rules. In particular, the elimination of tariffs would hurt the developing countries seriously. Most of these countries have continued to use conventional trade policy instruments, like tariffs, that are part of the GATT rules to pursue their development objectives. In the Doha Round a large number of developing countries are engaged in recalibrating their tariffs on sensitive products, which included the demand to provide additional dose of protection on agricultural products. Therefore, eliminating tariffs on goods for promoting e-commerce would force a large number of developing and least developed countries to offer concessions without any reciprocal benefits, which would worsen the already widening development gaps between WTO Members. Dwelling on the second question as to whether the demandeurs of e-commerce in the WTO have any possibility of realising their professed gains, including for their MSMEs, we analysed the availability of digital infrastructure using the data available from the World Development Indicators. We considered three indicators, namely, (i) access to internet; (ii) access to fixed broadband; and (iii) access to secure servers. The data show that a significant number of demandeurs of e-commerce from amongst the developing countries have extremely poor access to each of these critical elements of the digital infrastructure. Given such figures, together with the fact that resources in developing countries are usually very unevenly distributed, there is a very low probability that the MSMEs would get a meaningful share of the digital infrastructure. Thus, the major argument of the demandeurs for introducing e-commerce, namely that MSMEs in developing countries would get access to the international markets, just does not have any substance. There can, therefore, be only outcome of e-commerce and that is fast-tracking of the trade liberalisation agenda. Once this agenda is realised, e-commerce would become another vehicle for enhancing global inequities through trade liberalisation, which has been seen aplenty over the past three decades.16 The multilateral trading system under the GATT was established in 1947 with “a view to raising standards of living, ensuring full employment and a large and steady growing volume of real income and demand …”, which was adopted when the WTO was established nearly five decades later, but the functioning of the trading system has systematically undermined its objectives. There is no doubt that introduction of e-commerce would significantly reinforce this trend. 1. The first proposal on this subject of Electronic Commerce, also by the United States in 1995, cannot be considered as a full-fledged proposal on two counts. First, it concerned a plurilateral agreement, namely Government Procurement, and two, it spoke of using“computer and telecommunications systems for publicizing procurement opportunities and, in the future, even forming contracts … [for] increased competition, lower prices, shortened acquisition timetables, reduced administrative costs, and improved inventory control” (WTO. 1995: 1). 2. In a recent article, Monteiro and Teh 2017, confirm that this is indeed the case, when they state that under the “WTO work programme on e-commerce, e-commerce is understood to mean “the production, distribution, marketing, sale or delivery of goods and services by electronic means” (Monteiro and Teh 2017: 17). 3. Sam Fleuter proposes a similar classification of digital products (Fleuter. 2016: 157). 4. There is also considerable discussion on how the regime of intellectual property would be relevant for governing e-commerce. We are, however, not dealing with this dimension in the paper. 5. The Preamble of the Marrakesh Agreement draws substantially from the Havana Charter, which was the blueprint based on which the General Agreement on Tariffs and Trade (GATT) was to be replaced by the International Trade Organization (ITO) (United Nations Conference on Trade and Employment. 1948: 14). However, signatories to the GATT could not arrive at a consensus over the establishment of the ITO, and therefore the multilateral trading system could not get a permanent institution. 6. While considerable literature is available that documents the growing wedge between the developing and the developed countries following the implementation of the covered agreements of the WTO, we would refer to the Doha Ministerial Decision regarding “Implementation-Related Issues”and Concerns that reflected the wide ranging concerns of developing countries regarding the implementation of some WTO Agreements and Decisions from the point of view of their development aspirations (WTO. 2001a). 7. While launching the Doha Round, the Trade Ministers of WTO member states had remarked: “The majority of WTO Members are developing countries. We seek to place their needs and interests at the heart of the Work Programme adopted in …[the Doha] Declaration (WTO. 2001b: paragraph 2). 8. The importance of using such policy instruments by developing countries, which the developed world is challenging all the time, is highlighted by Ha Joon Chang (Chang. 2001). 9. We shall discuss in the next section that the 43 member African Group has critically spoken about the initiatives on e-commerce. 10. Another group of countries, namely, Mexico, Indonesia, Korea, Turkey and Australia (MIKTA) presented their reflections on the future of e-commerce in the WTO in 2016 (WTO, 2016). 11. The FED members are, Argentina, Chile, Colombia, Costa Rica, Kenya, Mexico, Nigeria, Pakistan, Sri Lanka, Uruguay, Moldova and Kazakhstan. 12. The countries are: Canada, Chile, Colombia, Côte d’Ivoire, the European Union, the Republic of Korea, Mexico, the Republic of Moldova, Montenegro, Paraguay, Singapore, Turkey and Ukraine. 13. The Information Technology Agreement (ITA) was adopted at the first WTO Ministerial Conference, held in Singapore after 23 countries endorsed it. Currently, 81 countries are parties to the ITA. This agreement was the first and most significant tariff liberalization undertaken after the establishment of the WTO, resulted in the elimination of import duties on a large number of high technology products and their parts and components. WTO has estimated that in 2013, trade in these products was about US$ 1.6 trillion. 14. Apart from these substantive proposals, there have been three submissions that have provided the Drafts of Ministerial Decision on E-Commerce, from the Costa Rica, Russian Federation, Hong Kong, Japan and Taiwan. 15. The issue of the essential pre-requisites for developing countries was raised briefly by Costa Rica, while proposing an “E-Commerce for Development Agenda to assess the needs of developing countries in relation to e-commerce and to facilitate focused dialogue on the challenges and opportunities they face”. Costa Rica’s position is that after the “E-commerce for Development Agenda” is adopted, the specific issues of concern for the developing countries can be addressed by a Working Group on E-Commerce (WTO. 2017g: 2). 16. Besides a considerable body of literature, which has spoken of this disruptive phenomenon, intergovernmental. Banga, Rashmi. 2017. ‘Rising Product Digitalisation and Losing Trade Competitiveness’. CWS Working Paper no. 39, Centre for WTO Studies (CWS), New Delhi. Chang, Ha Joon. 2002. Kicking Away the Ladder: Development Strategy in Historical Perspective. Anthem Press, London. Cohen, Daniel, Matthew Sargeant, and Ken Somers. 2014. ‘3-D printing takes shape’. McKinsey Quarterly, January. Available at: https://www.mckinsey.com/business-functions/operations/our-insights/3-d-printing-takes-shape, accessed on 22 October 2017. Dhar, Biswajit and Kasturi Das. 2015. Negotiations in the Doha Round: Critical Issues for India. in Jayati Ghosh (ed.). Economics: Volume 2: India and the International Economy, Oxford University Press, New Delhi. “Draft e-commerce law highlights safe trade, consumer rights”. China Daily. October 31, 2017. Available at: http://www.chinadailyhk.com/articles/116/238/78/1509460866795.html, accessed on 31 October 2017. Fleuter, Sam. 2017. The Role of Digital Products Under the WTO: A New Framework for GATT and GATS Classification. Chicago Journal of International Law, Volume 17, Number 1, Article 5. Available at: http://chicagounbound.uchicago.edu/cgi/viewcontent.cgi?article=1704&context=cjil. Accessed on: 15 October 2017.
International Labour Organization. 2016. Global Wage Report 2016/17: Wage inequality in the workplace. International Labour Office, Geneva. KPMG. 2017. “Overview of China’s Cybersecurity Law”. Available at: https://assets.kpmg.com/content/dam/kpmg/cn/pdf/en/2017/02/overview-of-cybersecurity-law.pdf, accessed on 31 October 2017. Marrakesh Agreement Establishing the World Trade Organization, Apr. 15, 1994, 1867 U.N.T.S. 154 (henceforth “Marrakesh Agreement). McCue. T.J. 2016. Wohlers Report 2016: 3D Printing Industry Surpassed $5.1 Billion. Forbes, April 25. Available at: https://www.forbes.com/sites/tjmccue/2016/04/25/wohlers-report-2016-3d-printer-industry-surpassed-5-1-billion/#139747c19a02, accessed on 22 October 2017. Monteiro, José-Antonio and Robert Teh. 2017. Provisions on Electronic Commerce in Regional Trade Agreements. World Trade Organization: Economic Research and Statistics Division, WTO Working Paper ERSD-2017-11. Geneva. National Board of Trade. 2016. Trade Regulation in a 3D Printed World – a Primer. Available at: https://www.tralac.org/images/docs/9500/trade-regulation-in-a-3d-printed-world-a-primer-kommerskollegium-2016.pdf. Accessed on: 22 October 2017. OECD. 2011. OECD Guide to Measuring the Information Society 2011. OECD Publishing. Available at: http://dx.doi.org/10.1787/10.1787/9789264113541-en, accessed on 12 October 2017. OECD. 2016. Towards a G20 initiative on measuring Digital Trade: mapping challenges and framing the way forward. Available at: http://www.oecd.org/g20/summits/hamburg/Towards-a-G20-Initiative-on-Measuring-Digital-Trade.pdf, accessed on 21 October 2017. OECD. 2017. Measuring Digital Trade: Towards a Conceptual Framework. Working Party on International Trade in Goods and Trade in Services Statistics, STD/CSSP/WPTGS(2017)3. Available at: http://www.oecd.org/officialdocuments/publicdisplaydocumentpdf/?cote=STD/CSSP/WPTGS(2017)3&docLanguage=En, accessed on 15 October 2017. Pérez-Esteve, Rosa and Ludger Schuknecht. 1999. ‘A Quantitative Assessment of Electronic Commerce’. Staff Working Paper ERAD-99-01, Economic Research and Analysis Division, World Trade Organization, September, 1999. Tran, Jasper. 2015. The Law and 3D Printing. The John Marshall Journal of Information Technology & Privacy Law, Volume 31, Issue 4. Available at: http://repository.jmls.edu/cgi/viewcontent.cgi?article=1770&context=jitpl. Accessed on 22 October 2017. United Nations Conference on Trade and Employment. 1948. Final Act and Related Documents. Lake Success, New York. United Nations Conference on Trade and Development. 2017. Trade and Development Report 2017 – Beyond Austerity: Towards a Global New Deal. United Nations, New York and Geneva. Wei, Xu. 2017. “Internet-industrial link to get government boost”. China Daily, 31 October. Available at: http://www.chinadaily.com.cn/business/2017-10/31/content_33920459.htm, accessed on 31 October 2017. Wohler Associates. 2017. Wohlers Report 2017 Shows Vibrant New Business Activity in 3D Printing with Softened Growth Worldwide. April 3. Available at: https://wohlersassociates.com/press72.html, accessed on 22 October 2017. World Economic Forum. 2015. The Global Information Technology Report 2015: ICTs for Inclusive Growth. Geneva. World Economic Forum. 2016. The Global Information Technology Report 2016: Innovating in the Digital Economy. Geneva. WTO. 1995. Electronic Commerce: Communication from the United States. GPA/IC/W/36, 21 December. WTO. 1996. Japan – Taxes on Alcoholic Beverages: Report of the Panel. WT/DS8/R; WT/DS10/R; WT/DS11/R, 11 July. WTO. 1998a. Global Electronic Commerce: Proposal by the United States. WT/GC/W/78, 9 February. WTO. 1998b. Declaration on Global Electronic Commerce: Adopted on 20 May 1998. Ministerial Conference, Second Session. WT/MIN(98)/DEC/2, 25 May. WTO. 1998c. Work Programme on Electronic Commerce: Adopted by the General Council on 25 September 1998. WT/L/274, 30 September. WTO. 1999a. Work Programme on Electronic Commerce: Submission by the United States. WT/GC/16, 12 February. WTO. 1999b. Work Programme on Electronic Commerce: Information provided to the General Council. G/C/W/158, 26 July. WTO. 1999c. Preparations For The 1999 Ministerial Conference WTO Work Programme on Electronic Commerce Communication from the European Communities and their Member States. WT/GC/W/306, 9 August. WTO. 1999d. Preparations for the 1999 Ministerial Conference – Electronic Commerce: Communication from Canada. WT/GC/W/339, 23 September. WTO. 2001a. Implementation-Related Issues and Concerns: Decision of 14 November 2001. WT/MIN(01)/17, 20 November. WTO. 2001b. Ministerial Declaration: Adopted on 14 November 2001. WT/MIN(01)/DEC/1, 20 November. WTO. 2004. United States – Measures Affecting The Cross-Border Supply of Gambling and Betting Services: Report of the Panel. WT/DS285/R, 10 November. WTO. 2005. United States – Measures Affecting the Cross-Border Supply of Gambling and Betting Services – AB-2005-1: Report of the Appellate Body. WT/DS285/AB/R, 7 April. WTO. 2013. Electronic Commerce, Development and Small, Medium-Sized Enterprises: Background Note by the Secretariat. WT/COMTD/W/193, 14 February. WTO. 2015. Briefing note: Electronic commerce. Tenth WTO Ministerial Conference, Nairobi, 2015. Accessed from: www.wto.org/english/thewto_e/minist_e/mc10_e/briefing_notes_e/brief_ecommerce_e.htm. WTO. 2017a. Work Programme on Electronic Commerce – Trade Policy, the WTO and the Digital Economy: Communication from Canada, Chile, Colombia, Côte d’Ivoire, the European Union, the Republic of Korea, Mexico, Montenegro, Paraguay, Singapore and Turkey. JOB/GC/116, 13 January. WTO. 2017b. Work Programme on Electronic Commerce – Electronic Commerce and Development: Non-paper from Brunei Darussalam; Colombia; Costa Rica; Hong Kong, China; Israel; Malaysia; Mexico; Nigeria; Pakistan; Panama; Qatar; Seychelles; Singapore and Turkey. JOB/GC/117, 14 February. WTO. 2017c. Work Programme on Electronic Commerce: Report by the Chairperson of the Council for Trade in Goods to the General Council. G/C/59, 21 July. WTO. 2017d. Minutes of the Meeting: Held in the Centre William Rappard on 26 July 2017. WT/GC/M/168, 22 September. WTO. 2017e. Informal Open-Ended Meeting on the Work Programme on E-Commerce: Statement by the Chairman. JOB/GC/136, 5 October. WTO. 2017f. Advancing Work on The E-Commerce Work Programme: Communication From Australia; Brunei Darussalam; Canada; Colombia; Costa Rica; Hong Kong, China; Republic of Korea; Lao PDR; Malaysia; Republic of Moldova; Myanmar; New Zealand; Nigeria; Panama; Qatar; Singapore; Switzerland and the Separate Customs Territory of Taiwan, Penghu, Kinmen and Matsu – Revision. JOB/GC/132/Rev.4, 7 November. WTO. 2017g. Work Programme on Electronic Commerce: Communication from Costa Rica. JOB/GC/139, 10 October. WTO. 2017h. Work Programme on E-Commerce: Communication from Australia, Canada, Chile, Colombia, The European Union, The Republic of Korea, Mexico, Montenegro, Norway, Paraguay and Ukraine – Draft Ministerial Decision on Electronic Commerce. JOB/GC/140 Rev. 2, 6 November. WTO. 2017i. E-Commerce Elements for MC11: Communication from China. JOB/GC/142, JOB/CTG/9, JOB/SERV/271, JOB/DEV/49, 19 October. WTO. 2017j. The Work Programme on Electronic Commerce: Statement by The African Group. JOB/GC/144, 20 October 2017. To read this paper in pdf format, click on ‘Download Now’ link below.